Almost providentially, the sound system at Trincas starts playing Yesterday as Usha Uthup walks in. Today, though, all her troubles seem here to stay. She is running an hour late for all her appointments; the traffic has unnerved her further and her mobile phone won’t stop ringing. “Why can’t I be left alone?" she bristles under her breath. It’s a question that is easier asked than answered. Everybody wants a piece of Uthup—arguably Indian’s pioneering pop singer, whose career in popdom and Bollywood playback now spans exactly 40 years; and Kolkata’s claim on her was reiterated almost physically by Uthup herself when she publicly started wearing a jumbo bindi styled on the initial letter of Kolkata’s Bengali spelling. There are Park Street old-timers who maintain that Trincas existed as an unassuming corner deli before the 50 years that the restaurant is currently commemorating. But all agree that it is only in these five decades that Trincas—under the stewardship of two friends, Ellis Joshua and Om Prakash Puri (the Puris continue to run it)—became the original home of live pop music in India, only to fall from grace when the Naxalite movement, the exodus of corporate houses and the Anglo-Indian community from the city, a higher entertainment tax regime and changing cultural morality teamed up to dent its fortunes. “But we never stopped having live music here," says Shashi Puri who, along with her husband Deepak and son Anand, runs Trincas these days. “Not even for a single day over all these years," she reiterates. “Molly was a black beauty from the Middle-East", J.L. Wadehra, the 69-year-old general manager of Trincas, muses. “And when she sang, there used to be a queue outside the restaurant." Since 1961, when Molly became Trincas’ first pop performer and its first star, the restaurant has seen a long list of bands and performers stopping by—somebody such as Biddu Appaiah, before he and Carl Douglas became famous with the international smash hit Kung Fu Fighting and much before Disco Deewane and Made In Indiahappened, even taking a cut on his professional fee to perform seven-eight months at Trincas, according to Wadehra. “Some years back, he came back with a troupe from the UK to film at Trincas, where he had started his career with the band Trojans and later as the Lone Trojan," recalls Wadehra. Savages, Flintstones, Checkered Tricycle—a band that had as drummer Indian rock music veteran Nondon Bagchi—Beat Four, Benny Rozario, Toto Wallang, Eve, Jenny, Linda and Flora—they have all performed at Trincas, as has a band called The Urge, which had in its ranks a young Goutam Chattopadhyay, who later on went on to be widely acknowledged as having pioneered the concept of Bengali bands singing their originals, with his own Mohiner Ghoraguli (Mohin’s Horses). While other Park Street restaurants had musicians such as Louis Banks, Pam Crain and Lou Majaw performing jazz, soul and rock, pop music was the reason Kolkata’s party set thronged Trincas. “It was the era of great pop music and I remember being there at Trincas as a five-year-old as my father performed Tom Jones and Engelbert Humperdinck. And of course, I remember the blow accordion that uncle Joshua had gifted me there," remembers Toto Wallang’s son Rudy, a guitarist and founder of blues band Soulmate. 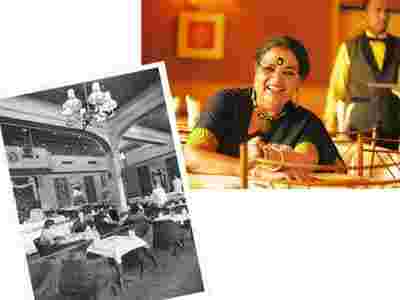 It wasn’t easy to break out of the Trincas fold: Over the years, only one singer, Jenny, got “stolen" from the restaurant by The Oberoi Grand, says Puri. Neither was it easy to break into, says Sanjay Mishra, the Kolkata-born guitarist who moved to the US and, among other albums, recorded the critically acclaimed Blue Incantation album with the legendary Grateful Dead frontman, the late Jerry Garcia. “Back in the mid-’70s, our band Mahamaya was mostly rejected at Trincas and it was difficult to get past the Anglo-Indian mafia there. Mr Joshua was the godfather," Mishra says, laughing. On 1 October 1969, some of the stereotypes surrounding female nightclub singers in India were shattered at Trincas. That is when a young Usha Iyer (Uthup’s maiden name) took the spotlight at the crowded restaurant, wearing a sari and flowers in her hair and singing Little Willie John’s Fever. “There I was in a cheap cotton sari and not in a gown. I wasn’t fair-skinned too, neither did I have blonde hair. After I took over at Trincas, there were more Bengali families coming, possibly because the women found it safer with me around," says Uthup. But in those days, a lady singer in a bar had to get a permit from Lalbazar, the police headquarters, with strict guidelines forbidding interaction with guests or soliciting. “The only person I solicited in Trincas, I went on to marry," Uthup says, recalling her first meeting with Jani, a tea industry professional. “After my first performance, he came up to me and said in a statesman-like voice, ‘You were good tonight’. I was like ‘Oi saala, this is good’ and fell head over heels in love. He stopped coming for my shows after we got married," she says. The familiar roar of laughter follows. Uthup went on to do the playback for some of Bollywood’s pop hits in films such as Shaan, Shalimar, Disco Dancer, Hare Rama Hare Krishna, right up to recent releases such as Tashan and Joggers’ Park. It all comes back to Trincas. “I had a strong bass voice and was an oddity among female singers. But Trincas accepted me whole-heartedly. It’s hallowed ground for me," she says as younger waiters hang around her table in reverential attention, not oblivious to Uthup’s 40-year association. But it isn’t so for everyone. No longer, at any rate. A city musician who had performed there some time back complains of an indifferent and unappreciative audience. Yet another musician talks about the constant pressure to pamper the audience with whatever’s-on-TV kind of music, even the commercial Bollywood variety. “But Trincas has always been with the times," reasons Nigel Gomes, bandleader of Sweet Agitation, the in-house outfit of Anglo-Indian musicians which has been a regular at Trincas for 25 years. The band’s set list says it: Alan Parsons Project, Van Halen and Bheegi Bheegi and Pehli Nazaar, all together in a marketable mix. “Our music too is in the zone. We play for the audience," says Gomes. Admittedly, much has changed. The Anglo-Indians, Jews, Europeans, Armenians and expats who once patronized the place have been replaced by a different set of people with a vastly different ear for music. Puri shows us old photographs of actors Dilip Kumar and Saira Banu at Trincas, and talks about Raj Kapoor and Dev Anand visiting, Vishu Mohan Wadehra, who has worked at Trincas for 40 years and is proud to have been in the frame in Satyajit Ray’s Pikoo when the film-maker shot at the restaurant, points to the window table Amitabh Bachchan used to occupy during his early days in Kolkata, before he made it big in Hindi films. Two men wearing T-shirts of a mobile telephone company occupy the table now. The photographs also tell another story. The wide arches that once dominated the hall have been replaced by a loudly painted low ceiling. The round comfortable chairs have made way for wrought iron ones; ordinary white tiles adorn the floor where once there were carpets. Yet, at Trincas, where the music never stopped, the photographs throw up an important element that remains unchanged: The stage continues to be where it was.